Why Do So Many Cruisers Converge on George Town? We’ve been in George Town for almost two months, having arrived here on January 16, 2016. The settlement of George Town is located on the island of Great Exuma at the southern end of the chain of 365 islands and cays in the Exumas. (An island is a land mass completely surrounded by water. A cay, pronounced “key” in the Bahamas, is an island that forms on top of coral reefs.) When traveling south along the Exuma chain, George Town is the first settlement most cruisers have visited since they left Nassau that has a large selection of services such as: two large well stocked grocery stores, two banks, a small hardware store and a very large one with marine supplies, a dive shop, several places to get propane, two laundromats, a library, a marina, a deli with a large selection of meat, many restaurants, a pharmacy, a clinic, a dentist, a bimonthly visiting vet and dog groomer, businesses that can repair small engines and refrigeration, liquor stores, a Batelco (Bahamas Telephone Company) office, a phone and electronics store, a computer repair shop with wifi and phone services, hair salons, masseuses, nail salons, bakeries, gift shops, Customs and Immigration offices, gas stations, a straw market, and much more. Some smaller settlements in the Exumas have a few of these but grocery stores not located in a house and banks with ATM’s, in particular, are only located here in Georgetown. Most cruisers headed further south to the Caribbean stop in George Town to provision for food and other supplies. Once we arrive here, our destination for half of our time in the Bahamas, we breathe a sigh of relief. Finished are the days of checking weather to see if we can move on, and rocking and rolling in anchorages when we can’t. While the area is called George Town, that is just the name of the small Bahamian town located on the east side of Elizabeth Harbour. Stocking Island, where the anchorages with the best protection from the prevailing east wind and the three mooring fields are located, is on the west side of the harbour. In the harbour there are designated reefs where one can snorkel. 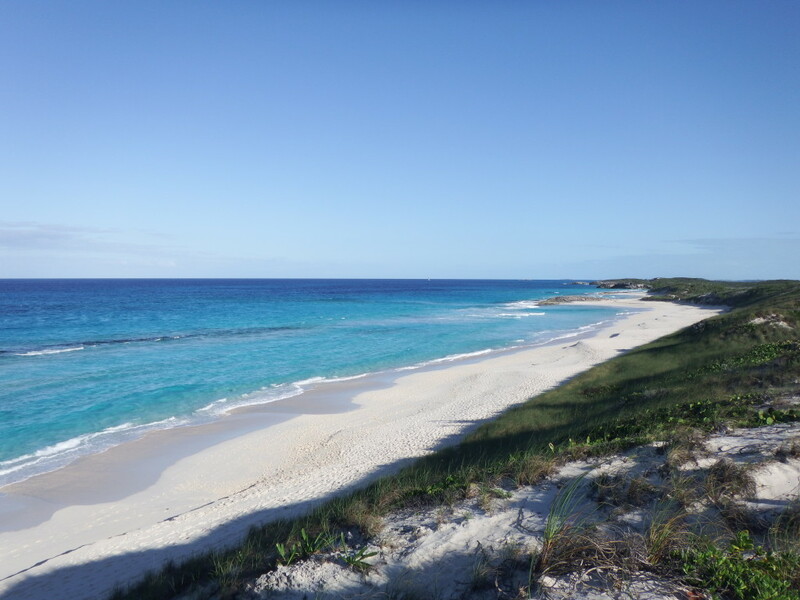 On Stocking Island, numerous sandy beaches are located on the harbour side for swimming, and long sandy beaches great for walking and swimming are on the Exuma Sound side. 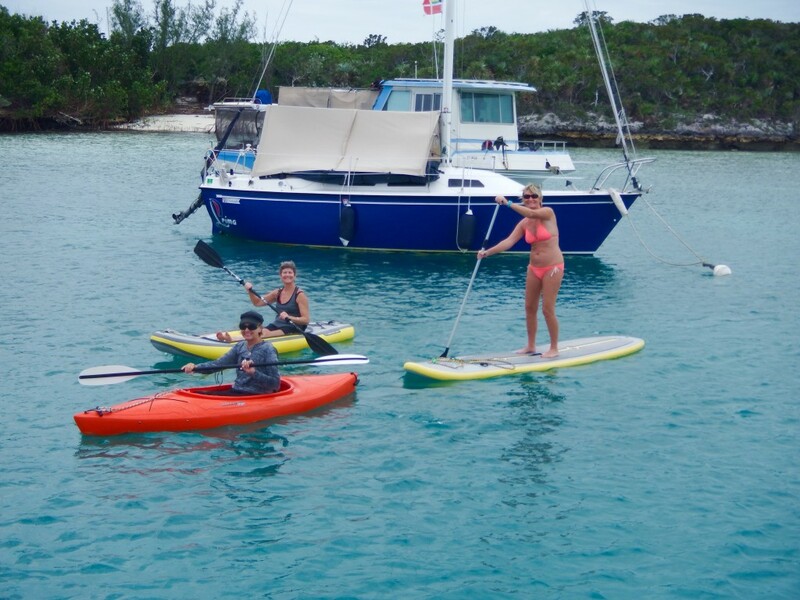 A short dinghy ride out into the Exuma Sound is the best place for fishing and spearing lobsters. 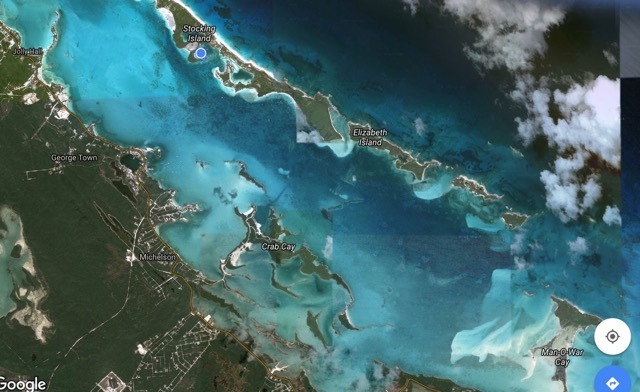 The Exuma Sound is actually part of the Atlantic Ocean with very deep water offshore. Kite surfers like to use the harbour, but when the Sound is calm, they are out there too. Below is a satellite picture of Elizabeth Harbour. Our mooring field in Hole 2 is located by the blue dot below the word Stocking Island on the map. The settlement of George Town on Great Exuma Isand is directly across the harbour from us, about a mile by dinghy. When the water is rough we either don’t cross the harbour or we wear rain coats and pants so our clothes are dry when we arrive in town. 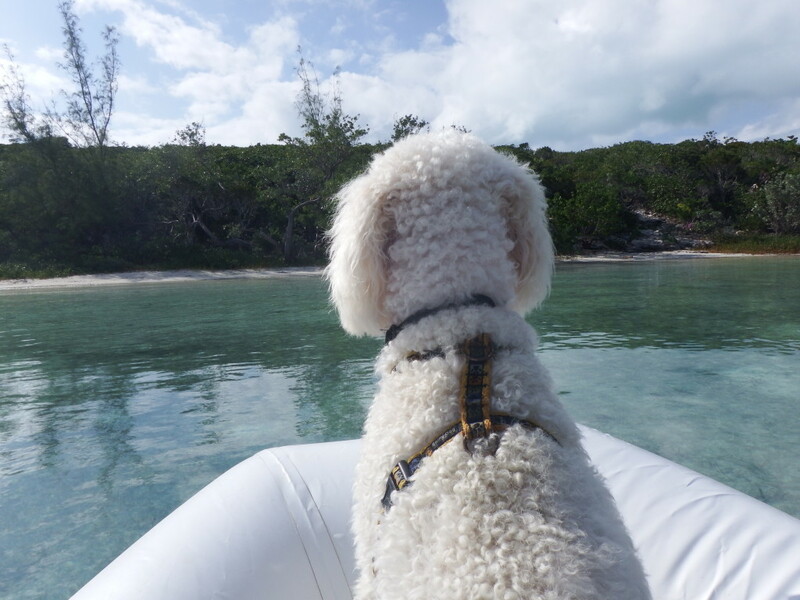 This is our fifth trip to the Bahamas and last year when we came to George Town we took a mooring ball in one of the three “holes” on Stocking Island. The other years we anchored in the harbour. Last year I had three month old knee replacements and I didn’t want to deal with getting in and out of a dinghy in an anchorage with rough water. After a few days of totally calm water in Hole 2, regardless of the speed or direction of the wind, we knew we were spoiled. This year, there was no question about it. We were ready to grab a mooring ball in Hole 2 as soon as we arrived on January 16. Unlike some places in the Bahamas, these mooring balls are very secure and checked regularly. Hole 1 is called “The Fruit Bowl” and is mostly filled with houseboats with names like “Cantaloupe,” “Pineapple House,” and “Papaya.” They obviously stay here year round, but some of the Hole 1 balls are used by cruisers here for the season or maybe a few weeks. They like it because it is very close to the popular Volleyball Beach. Hole 2 is a bit more protected and boats have survived hurricane force wind with no damage. About half of the boats in Hole 2 do not have people on them right now, with their owners flying in for short visits throughout the year or coming to their boats and sailing to nearby destinations. At least four airlines fly into the Great Exuma Airport and cruisers or their guests leave and arrive daily, together with packages delivered to locals and cruisers. Hole 3 is a true hurricane hole and no one is allowed to live on the boats there. Many boats are stored there while their owners are home in various parts of the world. There is a small deep “blue hole” in Hole 3, filled with fish, a popular place for snorkeling. Numerous turtles live in the mooring fields and occasionally dolphins visit, although they seem to prefer the open water in the harbour. At least once a day someone will come on the hailing channel 68 and announce “dolphin alert in _______ anchorage.” The harbour is filled with fish, starfish, stingrays, dolphins and the occasional shark. Being on a mooring ball in Hole 2, we rarely rock. On occasion a small boat will speed past us, between Hole 1 and Hole 3, creating a slight wake. It is calmer in Hole 2 than at any marina or mooring field where we have stayed in the Bahamas or the States. As I write this blog entry, the winds have been in the 20+ knot range all day long and our boat hasn’t moved. One of the other nice things about being in Hole 2 is the friends we have made. Below are photos of one of the bonfires we have had in our hole this season. 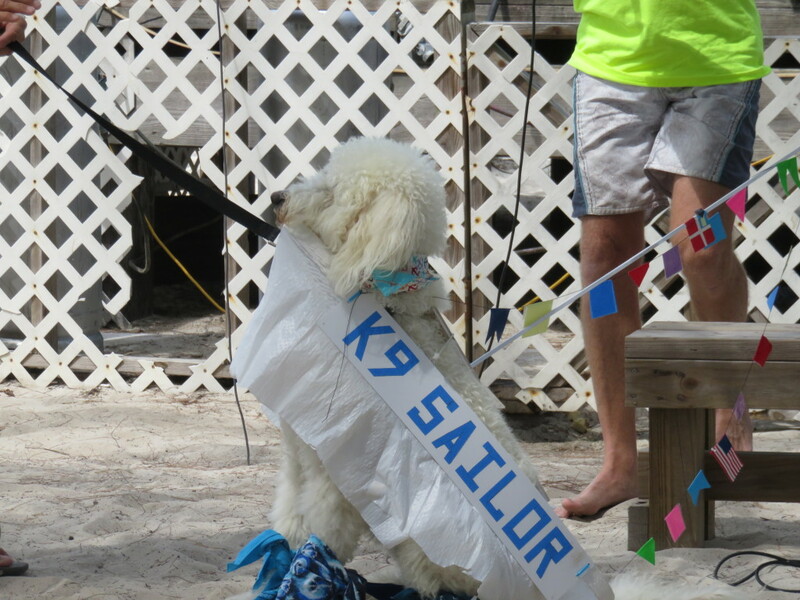 There is a small beach in Hole 2, and that is where Sailor goes ashore twice a day. He could swim the short distance to the shore, but he rides in the dinghy and then jumps out. Usually there are one or two other dogs to play with who live on boats in Hole 2. Other dogs could come to this beach but since every anchorage is near a sandy beach, that is where dogs on those boats go to play. Last year, Sailor’s BFFF (best furry friend forever) Zorro, a Portuguese Water Dog, was here in Hole 2 on MV All In. Unfortunately Zorro and his family were not able to come back this year. Libby from SV Flying Dog and Tasha from SV Tikitiboo often played on the beach with Sailor. 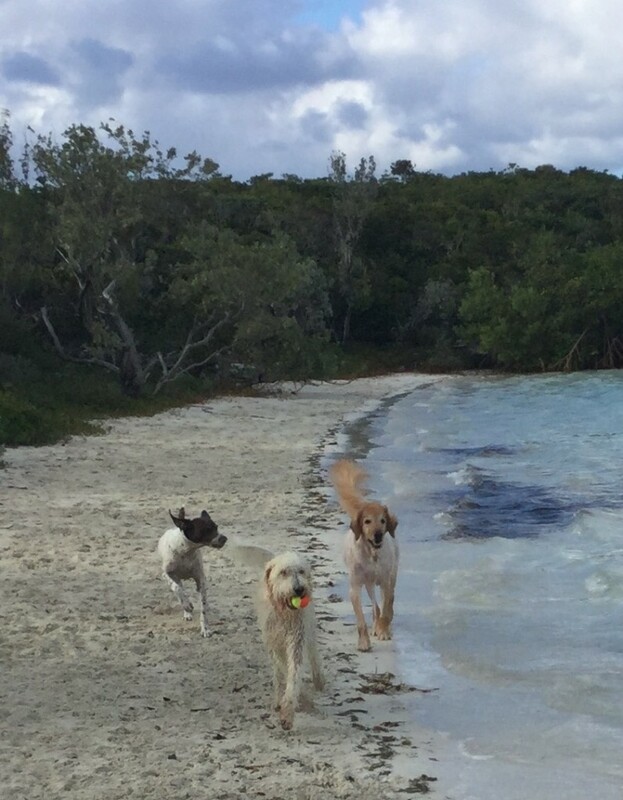 Libby preferred to eat coconuts, but Tasha, a shaved Golden Retriever (very smart idea to keep shedding down), loved to run on the beach and help Sailor fetch balls. Sadly, both went back to the States this week. Sailor still enjoys running on the beach and swimming, but he likes it better with a friend. Since the mooring fields are so protected, they are an ideal place to paddle on our kayaks. Sometimes I join friends on their kayaks and sometimes we paddle alone. 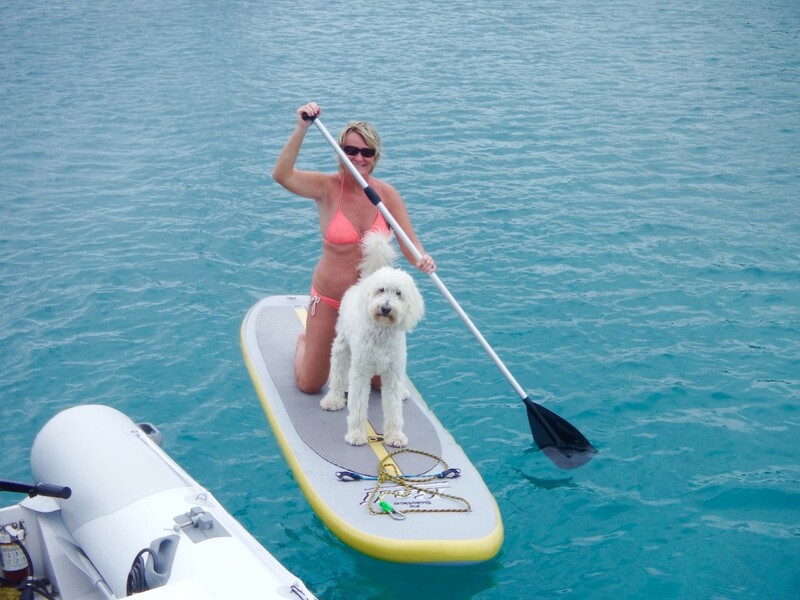 One friend, Christina, has a stand up paddle board and Sailor enjoyed jumping on her board and taking his first ride on one last month. He doesn’t fit in our kayaks, so perhaps a SUP should go on our list of things to buy for the boat. Many cruisers have kayaks and SUP’s onboard and of course we see them paddling along the shores in the harbour, but it’s much easier to paddle on flat water in the holes. 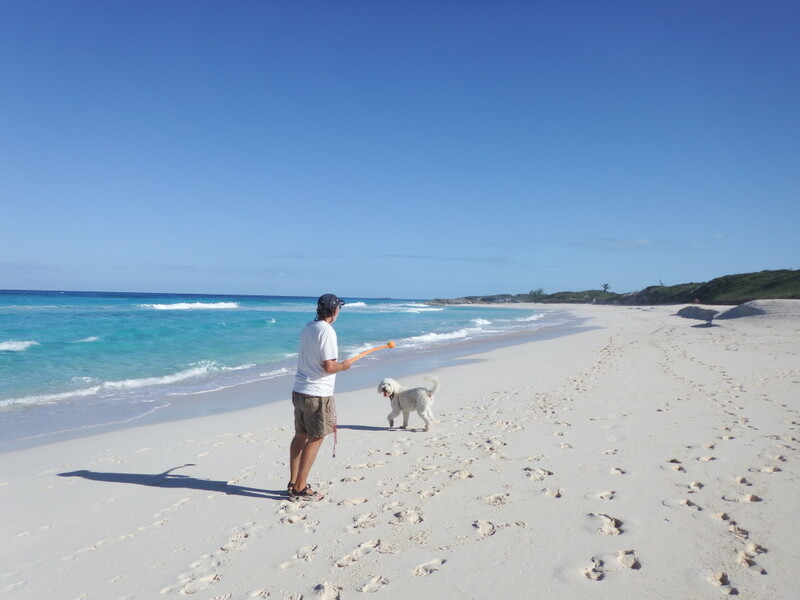 We love walking on the beach on the Exuma Sound side of Stocking Island. It is usually empty or might have a few people walking on it or swimming in the turquoise water. Needless to say, it is a beautiful beach for dogs and people. We got “hooked” on Texas Hold’em last season, and this year we returned to playing Tuesday and Thursday nights at the local resort, St. Francis. Luckily it is located next to our mooring field, so even when it’s windy and the water is rough in the harbour, we can dinghy to poker without getting wet. On Saturday, we host a game on Seas the Day. Last year we had the same group of six couples every week, all from Hole 2. Three of those couples did not return this year, so we had to recruit new players. Unfortunately some of them have not been able to come every week, but we are always able to have about 12 people playing, the men at the large table in the cockpit and the women at the salon table. When we get down to six or seven people, they move to the inside table and sometimes we have a “losers table” in the cockpit. Halfway through the game, we stop to have snacks and drinks. Both at the St. Francis and on our boat, each person puts $5 in the pot and the top three players split the money on the boat while the top five players split a much larger pot at the St. Francis. 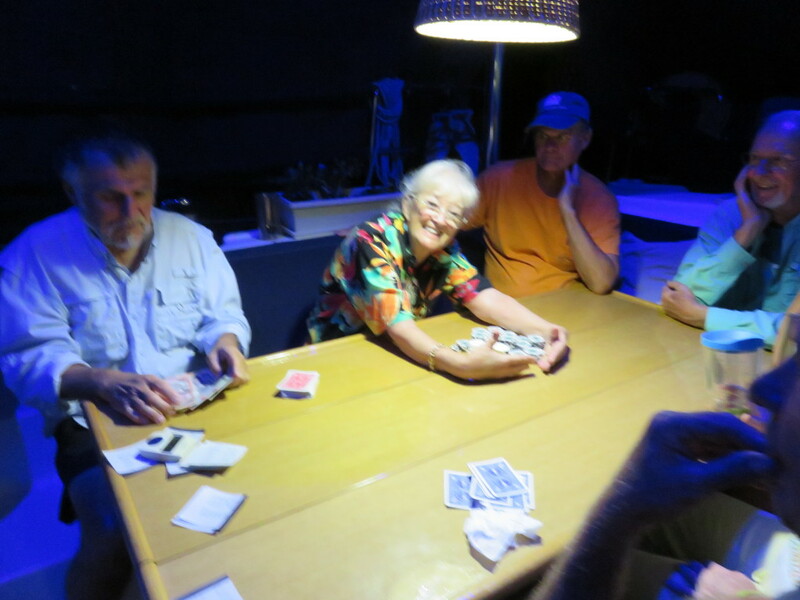 Below is a photo of our friend Jean (MV Winterlude) when she got all the chips and won a game on our boat. This year, I decided to try water aerobics. It is held every morning at 9:30 on one of the beaches by the monument. We call it South Beach, since it is the most southerly beach of the several beaches near the monument. The instructor, Callie on SV Serenity, is a well trained yoga and water aerobics teacher and she makes the class a lot of fun. Music mostly from the 70’s and 80’s is played from a device resting in her dinghy, floating next to her. The water temperature is in the high 70’s but sometimes, especially if it is very windy and the sun isn’t shining, it feels chilly when we arrive and climb out of our dinghies. However, we all warm up quickly with the fast paced exercises. 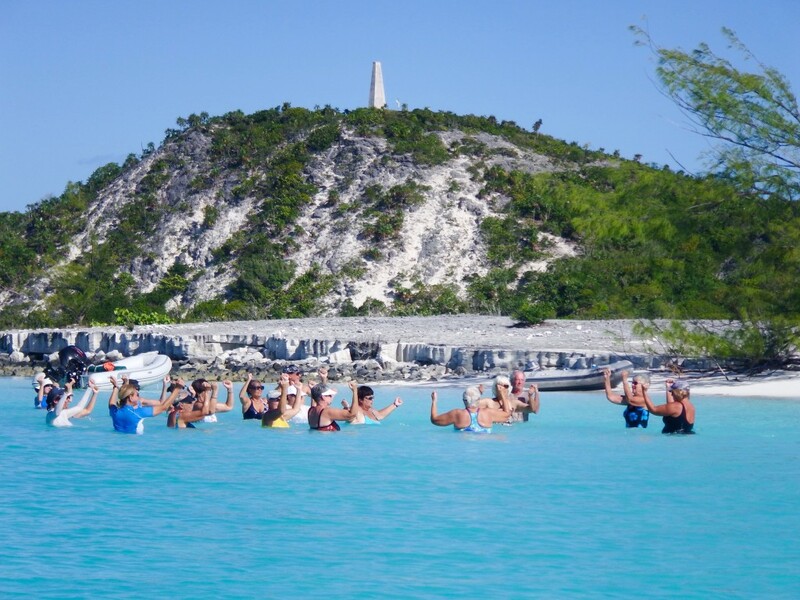 There is also yoga offered on another beach at the same time. As with all events here, classes are free. Occasionally Callie will jokingly say, “You get what you pay for,” but we would gladly pay her for this incredible experience. Impromptu sundowner get-togethers are held on various beaches, where everyone brings their own drinks and snacks to share. Someone announces over the VHF radio the time and place, and dinghies arrive on the beach. It’s a great way to meet new friends and greet old ones. Occasionally an ARG (Alcohol Research Group) meeting is called, which involves a bonfire, singing, musicians playing, and of course eating and drinking. 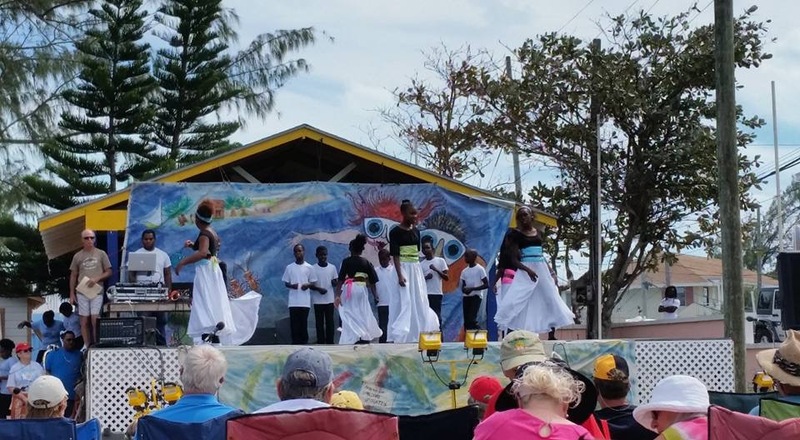 Many other regularly scheduled activities are available, including a Bible study group, trivia, bridge, dances on Volleyball Beach with a DJ, Bahamian “Rake and Scrape” dances at several restaurants in town, volleyball, and softball. A group of cruisers also meets every week with children from the local school who need help in reading. At 2 pm every day, cruisers arrive on Volleyball Beach to (surprise) play “fun volleyball,” take part in all sorts of board and card games such as Mexican Train, or sit around and talk. Chat ‘n Chill, a restaurant with burgers, drinks and more, is located on Volleyball Beach. The owner does not allow people to bring their own food and drinks to that beach, so if cruisers want to eat or drink, they buy it from him. Whenever someone wants to talk to a group about various topics, this is also the beach they use. There are numerous benches and picnic tables under large Casuarina Trees for shade. A tire hangs from a rope swing in one of the trees for the children on boats to use. On most Sundays during the cruising season a local historian shares interesting and educational stories about the Bahamas. Last week, Jeff and Karen Siegel, developers of the popular Active Captain (a website used by cruisers to share reviews of marinas, anchorages, etc.) gave two talks: one on what to do in a medical emergency and one on the most recent cruising APPS and other technology to use on a boat. The medical talk was not a first aid class, but rather gave valuable information on what to do when someone is hurt, especially on a boat, until help arrives. We are seriously considering buying an AED (automated external defibrillator) for the boat and know of several cruisers who have them. The Siegels were both EMT’s for many years before moving aboard their motor vessel. 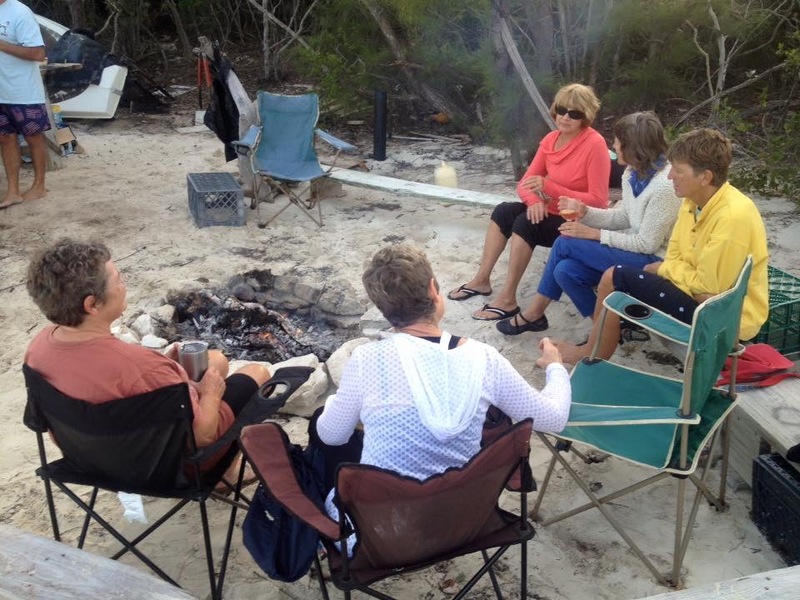 Whenever groups want to get together for a specific purpose they meet on Volleyball Beach. Recently one cruiser shared his expertise on marine electrical systems. 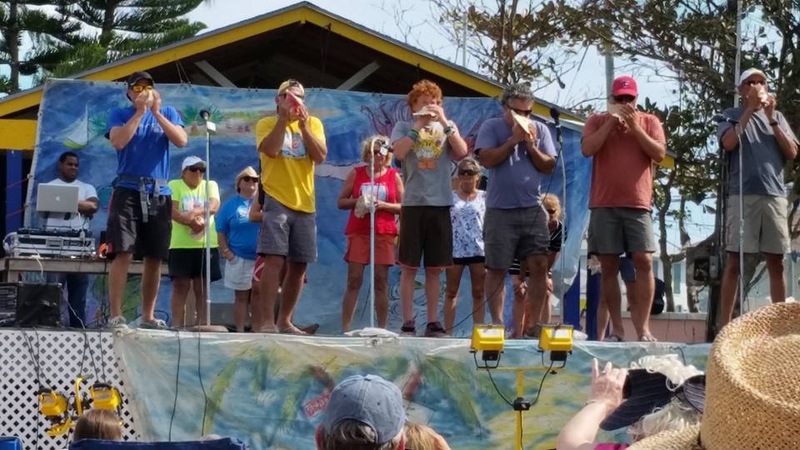 Another boater taught people to make conch horns so they could blow them at sunset. When a group of people are going to a particular destination, such as south to the Caribbean, or to Cuba, they meet to discuss their plans and then often travel together as boat buddies to their destinations. Usually an experienced cruiser who has been to those destinations leads the discussion. On Sundays, Beach Church is held on Volleyball Beach with cruisers taking turns sharing a message and a choir singing songs, followed by a fellowship time with coffee and treats. Last week was the 36th annual George Town Regatta. Here is a link to the regatta website with a list of all of the activities. There is also a Facebook page for the regatta with lots of pictures and information. There are always more than 300 boats here during regatta week. Many cruisers are now waiting for weather windows to travel north and eventually back to the States, or south to a variety of near and far destinations. 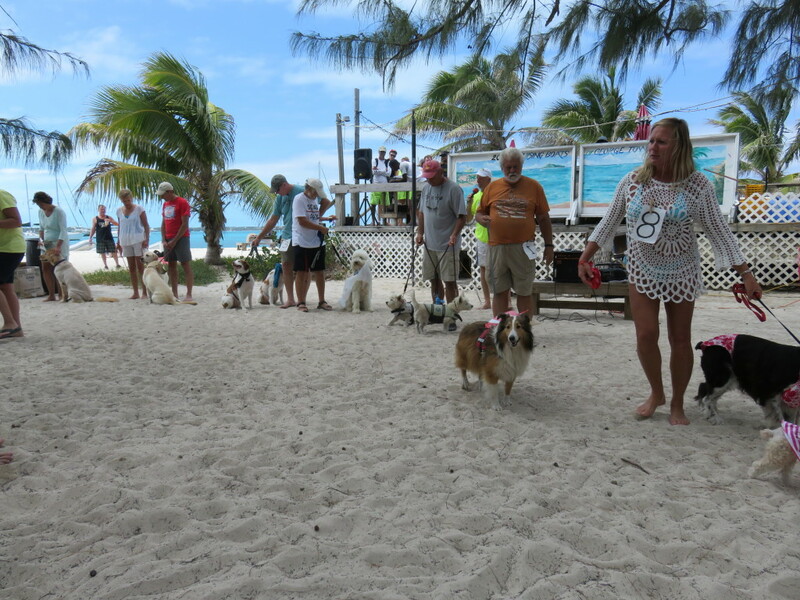 One of our favorite events during Regatta Week is the Pet Parade. 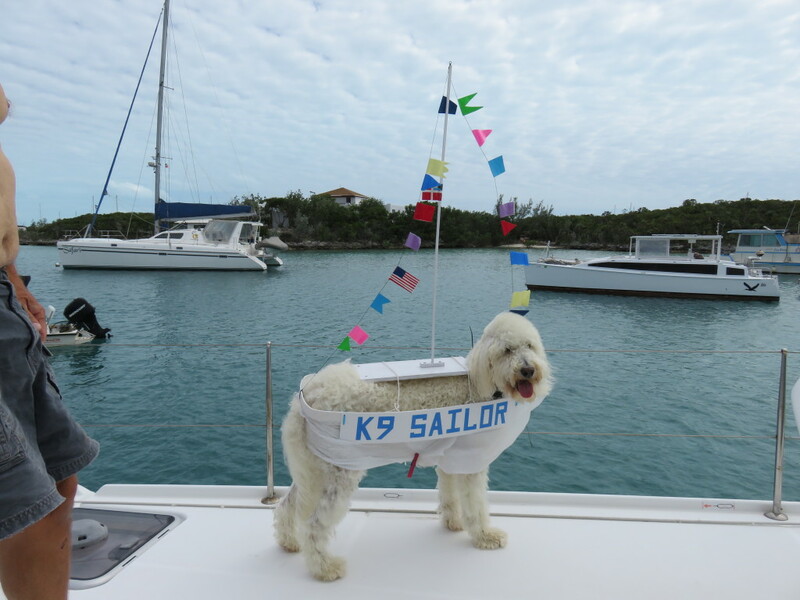 Sailor won this year for “Best Costume” wearing the K9Sailor sailboat that Mark made for him. He tried it on before we left and then competed on Volleyball Beach with a dozen pets who also live on boats. All the dogs got prizes. We have never entered our catamaran sailboat in the races, but two years ago we crewed on our friends’ monohull, SV Interlude. The first race is in Elizabeth Harbour and the second is around Stocking Island. There are also small boat races with kayaks, SUP’s, rowing dinghies, small sailboats, and more. 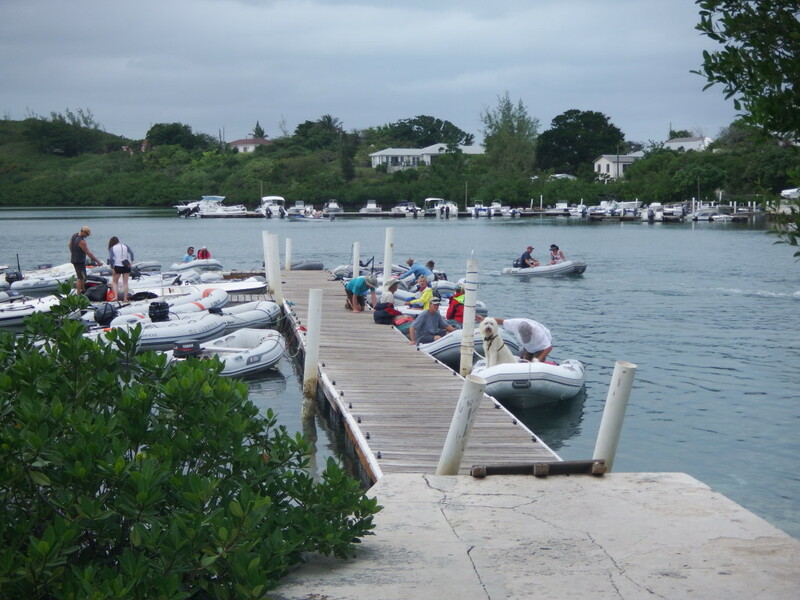 A poker run event is where cruisers motor in a dinghy to multiple bars and restaurants along the harbour, picking up one playing card for their group at each stop. The dinghy with the best poker hand wins. Bocce Ball and beach golf are other competitions and the cruisers’ softball team competes against a local Bahamian team. This year the score was a tie. A scavenger hunt is also a fun event. 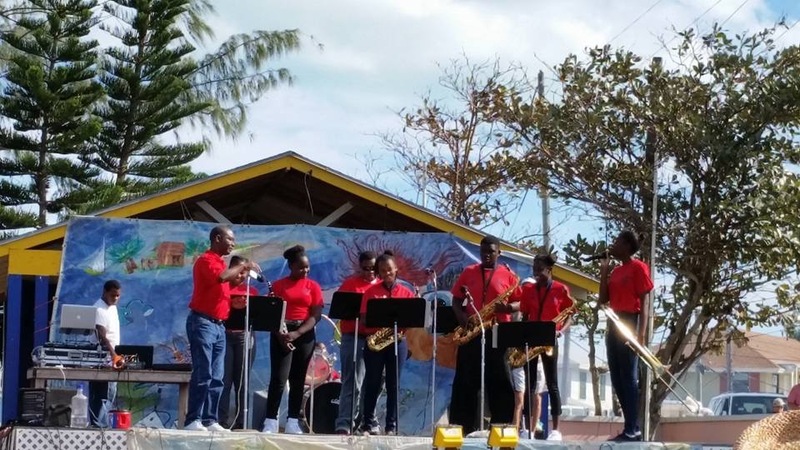 The regatta began with a Variety Show in town with cruisers and locals performing, and ended with an awards ceremony at the Peace and Plenty Restaurant in town. The George Town Regatta Facebook page has photos of most of these events and the website has descriptions of all of them. Thanks to Donna on SV Duchess for the pictures below of some of the Variety Show acts. My camera’s battery died when we arrived at the show. 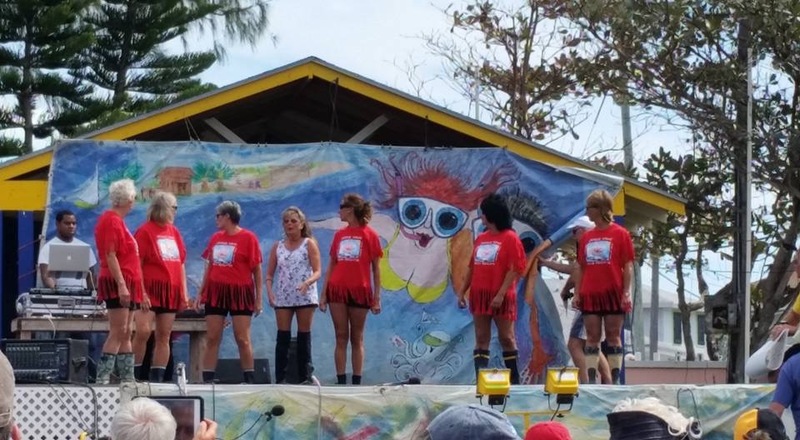 Every year there is a contest for the design to be used on the regatta t-shirts for the following year and cruisers vote for their favorite design at the opening event, the Variety Show. This year along with t-shirts, water resistant backpacks and hats were sold to raise money for regatta expenses. Any money left over is given to a local charity. 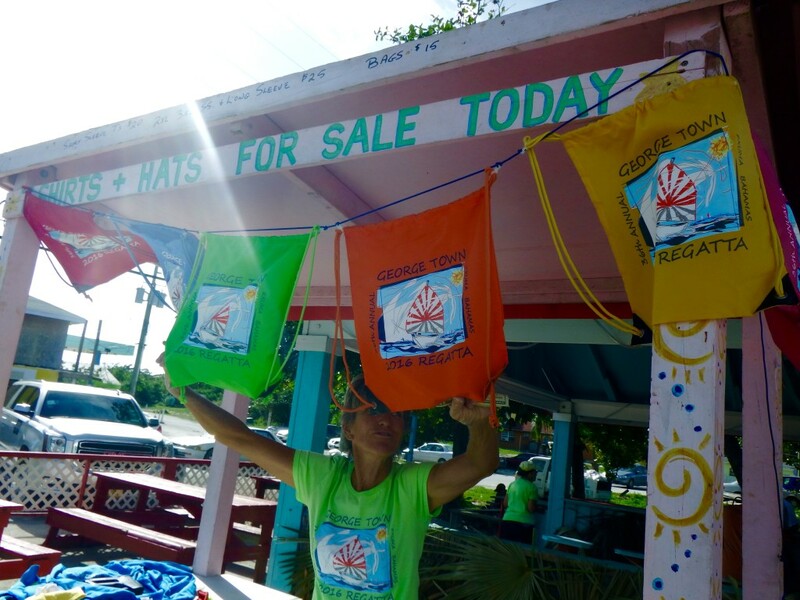 Volunteers sell regatta items at a small booth between the Exuma Market and the new Red Boon Cafe, a popular place for breakfast and lunch. There are lots of reasons why cruisers flock to George Town, although admittedly people either love it or hate it. We’ve heard it called “Adult Daycare.” Some cruisers think it is very “clique-y.” Other cruisers don’t like the crowded anchorages, although there are so many they could easily find an empty one in the harbour. Some people take advantage of many activities and others interact with a few old and new friends. Since there are many anchorages in Elizabeth Harbour and two mooring fields, it is easy to find a secluded anchorage or cruisers can choose one of several popular anchorages to be among many fellow cruisers either close to town or near the activities on Stocking Island. Boats with children on them love to come to George Town to meet up with other “Kid Boats.” They can be found playing together on the beaches, especially Volleyball Beach, and there are special events for them during the regatta. Young voices are often heard on the hailing channel calling their friends. Naturally, those who come here year after year make good friends and socialize with those friends. However, these same people are very friendly and anyone who wants to be part of that “clique” can join in by getting involved in the cruiser and/or local activities. There is a Cruisers’ Net every morning at 8 am on VHF channel 72. A volunteer “net controller” recognizes other cruisers and locals who indicate they want to share something. The Net begins with a weather report (someone reads marine weatherman Chris Parker’s report for this area), then there is a section for local businesses, followed by community announcements, a section where cruisers can buy or sell or give away items, and the last section is where cruisers who have just arrived in the harbour tell about themselves and departing cruisers share their new destination and say goodbye. When cruisers ask for help with a problem on their boat, they get numerous offers after the Net ends. Last year, our freezer stopped working and we asked on the Net if someone had a cooler we could borrow while Mark fixed it. Immediately after the Net ended, a cruiser offered us their 12V Engel freezer which kept our items frozen until Mark discovered the problem and fixed it. Requests like this are asked and answered here every day. This week, cruisers are collecting clothing and household goods for a young Bahamian family from George Town whose house burned to the ground. Many cruisers brought items to Long Island this year to help those who lost everything in Hurricane Joaquin last summer. Rum Cay lost all of its trees, so cruisers going that direction are bringing small seedlings provided by the locals from Great Exuma. Overall, cruisers love the Bahamas and especially the people here. It’s a mutual admiration society as the Bahamians appreciate the cruisers who spend their money here and in many cases lasting friendships are made between cruisers and Bahamians. Besides all of these activities going on, there is perhaps an equally important reason why cruisers stop in Georgetown for a day, a week, a month or more: groceries and free water. There are two well stocked grocery stores located on the shores of small Lake Victoria, which has an entrance from Elizabeth Harbour under a bridge on the main George Town street. One of them, Exuma Market, provides dinghy docks and a hose dispensing free RO (reverse osmosis) water. Dinghies line up along the dock by the water hose with their 5 gallon jerry jugs and fill them, return to their boats, and pour the water into their tanks. Even people like us who have watermakers supplement the RO water they make with a few gallons of the free water. When we run the watermaker we have to turn on our inverter and sometimes the generator, so it does take fuel and power. Below, a line is formed on the right with Mark and Sailor at the front putting water in our jerry jugs. In the rest of the Exumas, water costs 40 to 50 cents a gallon or more. In town we can also drop off garbage at $2 for a small bag or $3 for a large one. Rodney on the Harbour Services boat comes to all the anchorages near George Town to collect garbage, pumpout holding tanks and he also collects propane tanks to be filled and returns them a few days later. 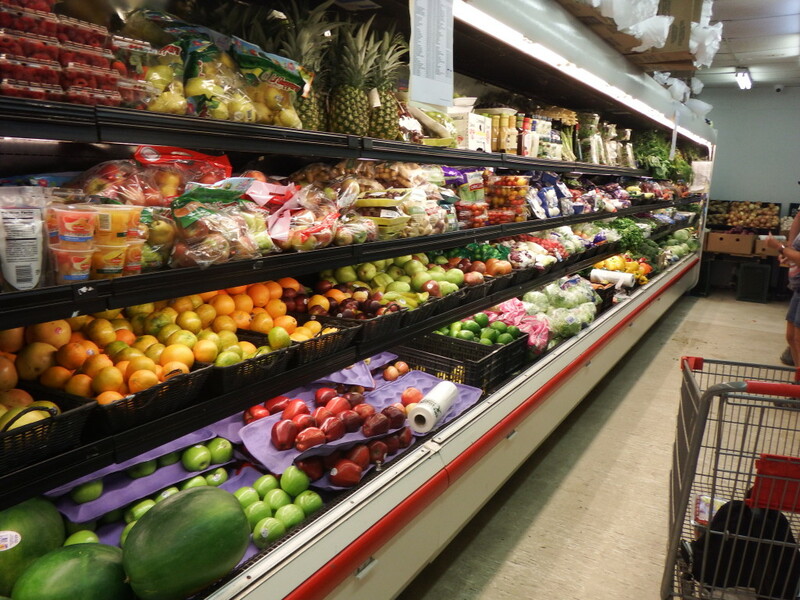 The Exuma Market has an excellent supply of fresh produce, together with meats, dairy products and other staples. Supply boats come twice a week to restock the shelves. In other smaller towns in the Exumas, you have to go to the store (usually in a house) on the day the boat arrives to get any fresh food. In George Town the shelves are fullest after the supplies arrive, but the shelves are never empty. Prices for most items are more expensive than in the States because most are shipped from the US and since last year, a 7% VAT is added to everything here. However, like most cruisers, we are happy to contribute to the local economy by buying items from them. We have less than a month left to relax and enjoy our stay in George Town. 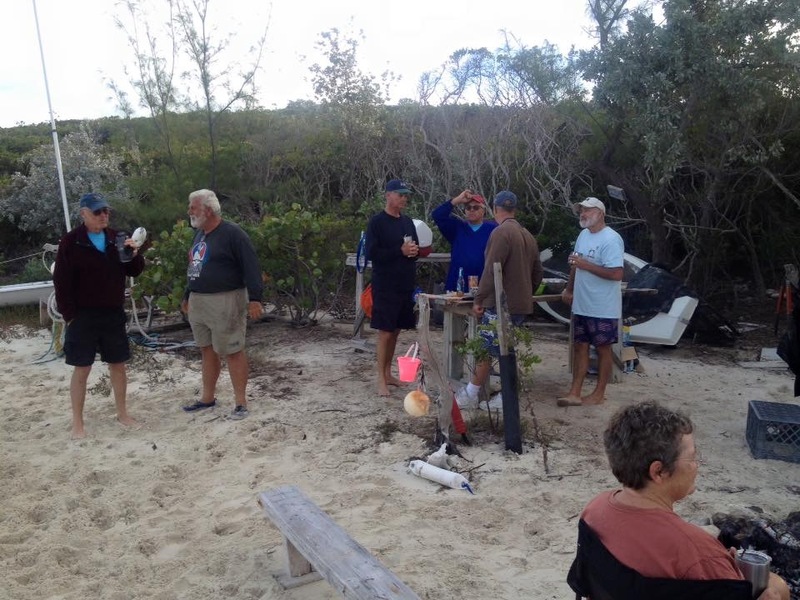 Friends from Hobe Sound, near our hurricane season marina in Stuart, Florida, will be flying into Staniel Cay on April 14th to enjoy a week aboard Seas the Day with us. We can get from here to Staniel Cay in a day, by sailing north on the Exuma Sound for part of the trip and then entering a cut to the shallow Bahamas Bank to travel along a chain of cays and islands until we reach Staniel Cay. We will leave here several days early to be sure we are in Staniel Cay when their plane touches down. As in all cruising, weather is the main consideration, and if there are strong winds out of the north or high seas predicted, we’ll need to plan an earlier departure from George Town. 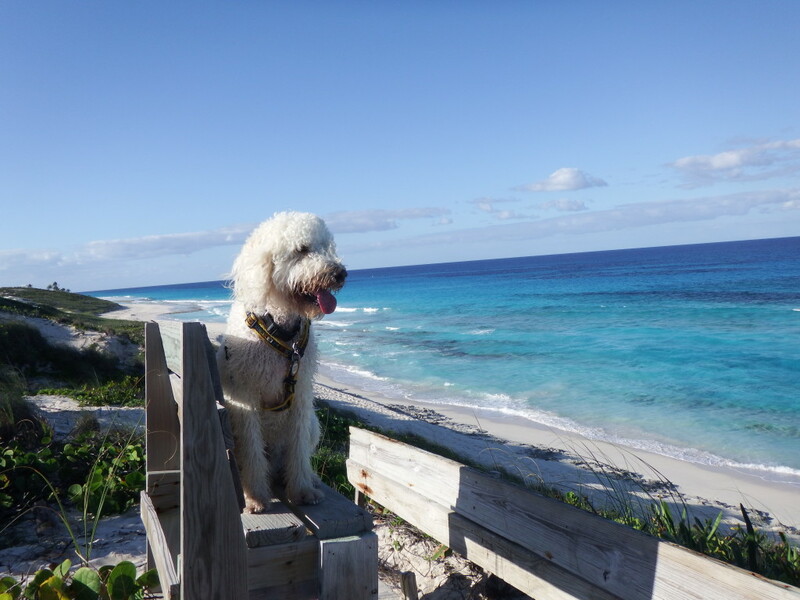 We’ll be in the Exumas and Eleuthera during April and most of May we’ll stay in Spanish Wells, returning to Florida at the end of May. This entry was posted in 2015-2016 Bahamas Cruise and tagged Bahamas, Elizabeth Harbour, George Town Regatta, Georgetown, Hole 2, Solar Panels, Texas Hold'em, Weather, Wind Generator on March 9, 2016 by Jan.